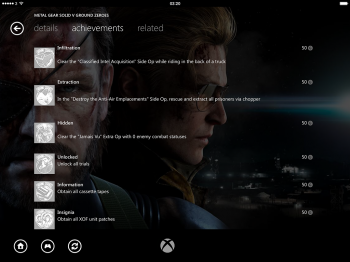 Here are the complete Achievements/Trophies you can earn in Metal Gear Solid V: Ground Zeroes and one has you collecting XOF unit patches. Over on NeoGAF, the complete Achievements list for Metal Gear Solid V: Ground Zeroes has just been revealed, which might surprise some people keeping tabs on Hideo Kojima's latest title. Before you read on, the list does contain what I consider minor spoilers, so keep that in mind before clicking the images below. It seems Ground Zeroes' main mission won't just be rescuing Chico; as the list also mentions a "Downfall" Achievement that players can earn for clearing the "Ground Zeroes" mission. Another notable one is the "Insignia" Achievement, where players are tasked to obtain all XOF unit patches -- something that sounds similar to dog tag collecting in Metal Gear Solid 2. Remember when series creator Hideo Kojima said that Ground Zeroes will serve as a "tutorial" for MGSV: The Phantom Pain? 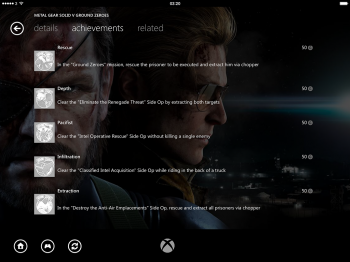 Based on the Achievements listed, that might just be the case, as the entirety of Ground Zeroes consists of only two main missions and the rest will be side-ops. 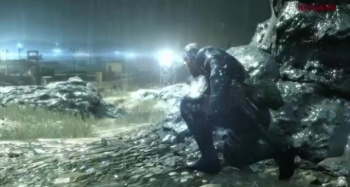 So, don't be surprised if Ground Zeroes is a short affair, since it does seem to be an appetizer for The Phantom Pain. 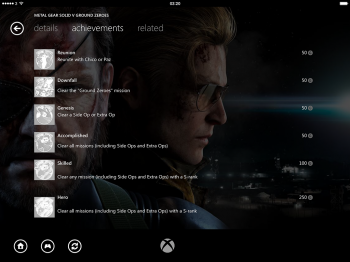 Oddly enough, the Gamerscore total for the entire lot is 1,100G, which is over the limit of 1000G per Xbox game. Aside from working on Ground Zeroes and The Phantom Pain, Kojima is also working on a "super confidential project," that I personally hope involves mechs or the Snatcher license. Metal Gear Solid V: Ground Zeroes will sneak out into retailer stores on March 18 for the PS3, Xbox 360, PS4 and Xbox One.